Space shuttle Atlantis departs the International Space Station on May 23, 2010 in this photo by Japanese astronaut Soichi Noguchi. 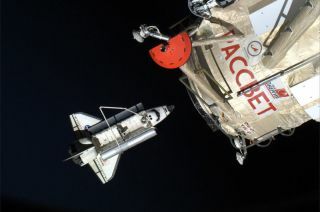 The new Russian research module Rassvet delivered by Atlantis' STS-132 crew can be seen in this view at the upper right. Thisstory was updated at 2:20 p.m. EDT. The six astronauts flying aboard spaceshuttle Atlantis worked Tuesday to prepare their spacecraft for its finalplanned return to Earth. STS-132 mission commander Ken Ham, pilotDominic ?Tony? Antonelli and mission specialistsGarrett Reisman, Piers Sellers, Stephen Bowen andMichael Good spent the day packing supplies, stowing equipment and testingAtlantis? flight control systems, all in an effort to bring the shuttle to alanding at NASA?s Kennedy Space Center (KSC) in Florida on Wednesday. Their first opportunity to land, weatherpermitting, is targeted for 8:48 a.m. EDT (1248 GMT). A chance of showers within about 30 miles ofAtlantis' landing strip poses the only concern, entry flight director Tony Ceccacci said. NASA is still hopeful despite Florida'sreputation for rainy summer weather, he added. "It's a 50-50 chance no matter what theforecast says," Ceccacci said. Today, mission managers also cleared Atlantisof any concerns related to its heatshield after reviewing data beamed to Mission Control from a Mondayinspection to seek out signs of orbital debris damage. While engineers on Earthtackled that, the shuttle crew prepared Atlantis to once again fly in Earth'satmosphere. ?The crew will power up one of the auxiliarypower units that provide its hydraulic power to the aerosurfaceson Atlantisand they will check those out along with some navigational aids that are usedto find the landing site,? described lead shuttle flight director Mike Sarafin on Monday. ?Once those are complete, the crew willproceed into some cabin stow activities and Atlantis will be ready to comehome.? ?The crew is doing exceedingly well and weall look forward if all goes well, to the return of Atlantis to the KennedySpace Center,? Sarafin added. Atlantislaunched May 14 and has enough supplies to stay in orbit through Saturday.NASA has planned two landing attempts into KSC on Wednesday and two more onThursday before calling up back-up sites at Edwards Air Force Base inCalifornia and in White Sands, New Mexico. ?We may get lucky and land on the firstattempt and the weather may cooperate, or we may have to go around another dayor two. We?ll just have to see how that plays out,? Sarafinsaid. Other activities scheduled for today aboardAtlantis included the astronauts stowing the high bandwidth antenna throughwhich they have been relaying live and recorded video, as well as exercisesessions to help prepare the crew for their return to gravity. The shuttle astronauts also tool time tospeak with reporters, including ABC News and tradejokes with Stephen Colbert, the comedian host of Comedy Central?s ?TheColbert Report." NASA currently plans to retireAtlantis after this flight, but will ready the spacecraft to serve as arescue ship as a safety precaution for the agency's final space shuttle missionslated to fly in late November. NASA and some lawmakers have been lobbying totake that rescue mission and turn it into a full-fledged extra shuttle flightfor Atlantis, but the space agency has not yet received approval to add themission to its schedule. After Atlantis lands, only two more shuttleflights remain, on shuttles Discovery and Endeavour, before the orbiter fleetis retired. President Obama?s proposal for NASA?sfuture post-shuttle is for new technology development and launch vehicles aimedat sending astronauts to an asteroid or Mars. SPACE.com isproviding complete coverage of Atlantis' STS-132 mission to the InternationalSpace Station with Senior Writer Clara Moskowitz and Managing Editor TariqMalik based in New York. Clickhere for shuttle mission updates and a link to NASA TV.